"History should be honest," Democratic California Gov. 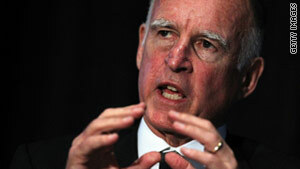 Jerry Brown said about the gay history legislation. Los Angeles (CNN) -- Democratic California Gov. Jerry Brown said Thursday he had signed a bill that will require public schools in the state to teach students about the contributions of lesbian, gay, bisexual and transgender Americans. The bill, believed to be the first of its kind in the nation, will also require teachers to provide instruction on the role of people with disabilities. "History should be honest," Brown said in a statement. "This bill revises existing laws that prohibit discrimination in education and ensures that the important contributions of Americans from all backgrounds and walks of life are included in our history books. It represents an important step forward for our state, and I thank Senator Leno for his hard work on this historic legislation." The governor was referring to the bill's author, Sen. Mark Leno, a San Francisco Democrat. California law already requires state schools to teach about the contributions of Native Americans, African-Americans, Mexican-Americans, and Asian-Americans, among other groups. "Today we are making history in California by ensuring that our textbooks and instructional materials no longer exclude the contributions of LGBT (lesbian, gay, bisexual and transgender) Americans," Sen. Leno said in a statement. Separately, he said the bill is thought to be the first of its kind in the nation. It will take effect in January, however, state textbooks are not likely to be updated until 2015, he said. Leno's office cited research that shows students who learn about LGBT people are more likely to report their schools are inclusive and fair. The bill, which passed the state legislature this month and the senate in April, according to the senator's office, is not without controversy. It has drawn criticism from some religious and conservative groups, like the Traditional Values Coalition, a lobby organization that says it speaks on behalf of more than 43,000 churches. "It is an outrage that Governor Jerry Brown has opened the classroom door for homosexual activists to indoctrinate the minds of California's youth, since no factual materials would be allowed to be presented," Rev. Louis Sheldon, chairman and founder of the Traditional Values Coalition, said in a statement. "If parents don't already have their children out of public schools, this should cause them to remove them," he said.